Заготовка на зиму – ПРИПРАВА "ПОЛТАВСКАЯ", рецепт без уксуса и стерилизации!. Как приготовить? Все видео пользователя: Коллекция Рецептов. Приготовим очень вкусную и ароматную овощную приправу на зиму. Я хочу с вами поделиться этим проверенным рецептом, чтобы вы тоже могли насладиться вкусом этой кисло-сладкой, в меру острой, пряной приправы. Она отлично подходит в качестве заправки к первым и вторым блюдам, а также как самостоятельный овощной гарнир к мясу, птице и рыбе. Но ее можно есть даже просто с кусочком хлеба – очень вкусно! Уже подписаны? ▶️ включайте колокольчик 🔔 чтобы получать оповещения о выходе новых видео! Нам понадобятся спелые томаты, репчатый лук, морковь, сладкий и острый перец, чеснок и кислые яблоки. Все овощи нужно помыть и при необходимости очистить. Репчатый лук и морковь очищаем и нарезаем произвольными крупными кусками, такими, чтобы было удобно измельчить в мясорубке. Красный острый перец можете использовать как свежий, так и сушеный, удаляем сердцевину и крупно режем. Яблоки лучше выбирать кислые, разрезаем их на четвертинки, удаляем сердцевину, кожицу не очищаем. Поскольку в рецепте нет ни уксуса, ни эссенции, то именно яблоки и томаты придадут этой приправе приятную кислинку. Яблоки, как и овощи нарезаем крупными кусками. 📢 ПОДЕЛИТЕСЬ ЭТИМ ВИДЕО С ДРУЗЬЯМИ в соц. сетях + рецепт сохранится у вас на странице! 👍 ОЦЕНИВАЙТЕ ВИДЕО! 👍 - это приятно для меня и важно для развития канала! 📝 НАПИШИТЕ КОММЕНТАРИЙ или задайте вопрос - я обязательно отвечу! 🔔 И самое главное - ПОДПИСЫВАЙТЕСЬ на мой YouTube канал и группы в соц. сетях, чтобы не пропускать новые видео-рецепты! Опубликую свои авторские фото/видео-рецепты в ваших кулинарных или других тематических группах в соц. сетях. 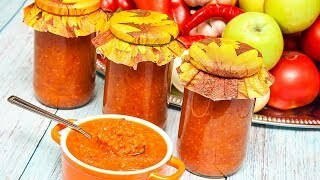 Harvest for the winter - FILLING "POLTAVA", recipe without vinegar and sterilization! If you get in the way of subtitles - turn them off! Hello! My name is Dina. And I'm glad to see you on the "Recipes Collection" channel. Today we will prepare a delicious and aromatic vegetable seasoning for the winter. I want to share this proven recipe with you, so that you too can enjoy the taste of this sweet and sour, to the extent of a spicy, spicy seasoning.. It perfectly suits as a refueling to the first and second courses and as an independent vegetable garnish for meat, poultry and fish. But you can eat it even with a piece of bread - it's very tasty! So, let's start, we need ripe tomatoes, onions, carrots, sweet and hot peppers, garlic and sour apples..
All vegetables need to be washed and, if necessary, cleaned. Onions and carrots are cleaned and cut into arbitrary large chunks, Such that it was convenient to grind in a meat grinder..
Red hot pepper can be used both fresh and dried, we remove the core and cut it large..
Apples are better to choose sour, cut them into quarters, remove the core, peel is not cleaned.. Since the recipe does not contain either vinegar or essences, it is apples and tomatoes that will give this spice a pleasant sourness..
Apples, like vegetables, cut into large pieces.. Since tomatoes we will also pass through the meat grinder, then for this recipe you can safely use any unconscious tomatoes - very large, ripe, slightly cracked or shapeless..
We remove the stems from the tomatoes and arbitrarily cut them..
We remove the core of sweet red Bulgarian pepper, free it from seeds and cut it too large, like the rest of the products.. Vegetables I prepared, and garlic, we will deal with later. We install the usual medium grate on a meat grinder and grind all the vegetables.. I immediately scroll them into a saucepan, in which I will boil the seasoning. The list of ingredients for this seasoning you will find as usual at the end of the video and in the description. For this amount of food you need utensils, with a volume of at least 5 liters..
We have scrolled all the vegetables, add salt, sugar to the pan, mix well and place them on the stove..
Oil and garlic will be added later. We bring the mixture to a boil, reduce heat, we record the time and boil the seasoning for 1.5 hours, while the mass should be stirred periodically..
For better evaporation of moisture, the pan is not covered with a lid. Heating on low heat makes it possible to achieve an excellent result - products boil, mix all tastes and flavors and as a result, the seasoning turns out to be thick and saturated enough..
And while the vegetable mixture is cooked, we'll peel the garlic. When we make blanks for the winter, sometimes we have to peel a lot of garlic, it's a tedious task, especially if the teeth are small.. But there's a great way to just brush the garlic. To do this, the head of garlic is divided into chicks, and poured them with hot water, such that the finger is tolerated, it is approximately 50 - 60 ° C.
We leave garlic in water for 15-20 minutes. Then drain the water and easily clean the garlic. With this method, the husk is watered, soft, elastic and very easily removed..
Look, once or twice. This method is great for billets with a lot of garlic - adzhiki, condiments, etc.,. And you can clean the garlic the day before, put it in a bag and put it in the refrigerator..
Cleaned garlic do not forget to rinse. After an hour and a half the vegetable mixture boiled well and now it's time to add garlic and butter..
Garlic must be crushed in any convenient way for you - through a press, on a grater or as in my case with a blender..
Pour the garlic into the bowl of the blender, lightly grind it, add vegetable oil there and bring the mixture to a homogeneous consistency..
With this method, garlic is finely crushed and no large pieces remain.. Send the garlic oil to the pan, stir well, note the time and boil for another 1 hour.. The main thing is not to lose consciousness, because we still need to prepare banks. Use jars of any capacity, I'll take a volume of 350 ml., Which you need to wash well, and sterilize..
As a rule, I sterilize them in a microwave - it's fast and very simple. We install clean jars in the microwave at full power for 4-5 minutes, with no need to pour water in them, they are sterilized by dry heat..
And I separately boiled the lids and dried them. The seasoning is completely ready, we pour it on jars, trying to fill them as much as possible.. Since these jars have a rather narrow neck, it is more convenient for me to use a watering can with a wide mouth..
Before you fill the next jar, stir well the seasoning. We tightly tighten the jars and turn them over, leave them in the kitchen until it is completely cooled, we do not need to wrap it up.. Depending on the juiciness of the products and the weight of the waste during cleaning, from this amount of ingredients is obtained from 3 to 3.5 liters of the finished seasoning.. I usually close 9-10 jars with a capacity of 350 ml. The seasoning turns out very tasty, aromatic and strongly stimulates appetite.. In 2,5 hours it boils well, it turns out thick enough, but it is easy to pour on jars, and after cooling it will thicken a little more..
You can store this workpiece both in a cool place and at room temperature and the open jar should be kept in the refrigerator, although the seasoning is so tasty that it does not stay there for a long time.. I really hope that this seasoning will also be pleasant to you, I wish you successful preparations and everyone a pleasant appetite!. If you liked this recipe - put "Like"! Share videos with friends and write your comments! Do not forget to subscribe to my YouTube channel - "Recipe Collection" and click on the bell to receive notifications about new videos.. I have on the canal and other delicious dishes from vegetables, I recommend to see. All links on the screen and in the description..
With you was Dina. To new meetings, to new delicious recipes!